My favorite part of summer is sitting outdoors. We entertain quite a bit during the warmer months and love spending time outside with family and friends. I recently thought about adding a picnic table to my outdoor seating, for extra seats and just because a picnic table is perfect for outdoor entertaining. So, instead of buying one, by the way, you’re going to spend a couple of hundred dollars on a good wooden picnic table, I thought that maybe I could build a DIY picnic table. 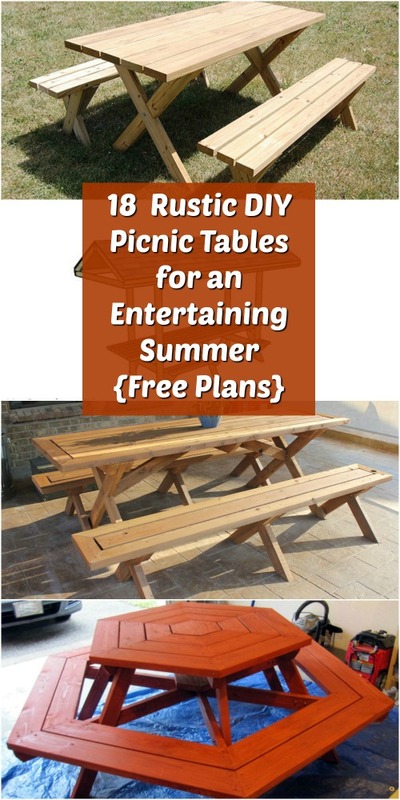 I found 18 easy DIY picnic tables that are perfect for your summer entertaining. These are all so simple to build and much cheaper than buying one already made – they’re a lot sturdier than some of those premade ones, too. From toddler picnic tables to tables for two, you will find the perfect picnic table for your outdoor entertaining this season. Note that you will want to use pressure treated wood to build these if you are planning to leave them out in the weather. Even with that, you’re going to save a fortune building one yourself. And if you really love building your own outdoor structures, be sure to check out these 26 DIY swings to turn your backyard into a playground. 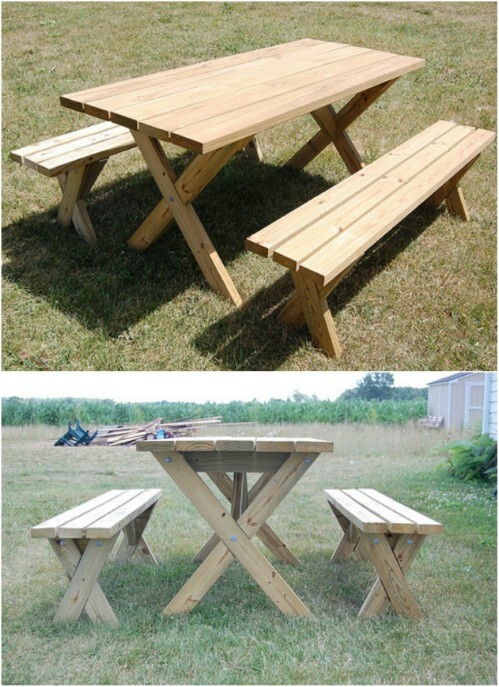 If you want a truly easy DIY picnic table, you definitely want to check these out. There are small, large and even roofed picnic tables that are perfect for keeping the sun, and rain, off of you while you enjoy the outdoors. Just add a grill and you have a great start to a fabulous summer! And, if you love grilling, I have a list of 10 awesome DIY barbecue grills that you just have to see. I hope you love these DIY picnic tables as much as I do and I hope that they help you to have the best summer ever! This 2X6 traditional picnic table is as easy to DIY as they come. This is the perfect table for your backyard. It has plenty of room to seat up to six people and you can easily build it in just a weekend. You need quite a bit of lumber for this one and since it’s going to be outside, be sure to use pressure treated lumber unless you plan to keep it on a covered porch or deck. Toddlers don’t really fit up to a traditional picnic table without a booster seat. If you want to forgo the booster, just build them their own little DIY picnic table. 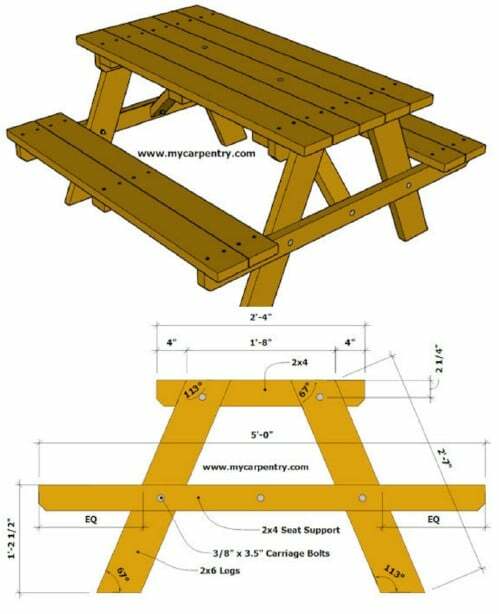 This one is the perfect size and height for your tiny little ones and it’s a really easy picnic table to build. You can finish this one in just an afternoon or two and put it right there next to your full sized DIY picnic table. If you want a DIY picnic table that doesn’t take up space when you aren’t using it, this convertible version is perfect. The bench folds down when not in use so you can easily store this one in even the tiniest space. 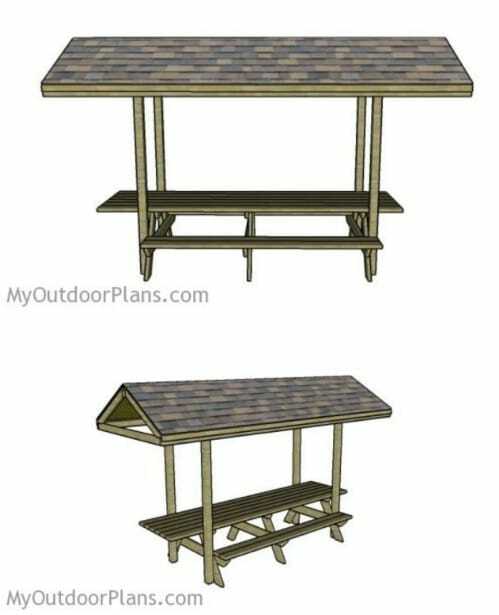 This is a really easy one to build, too and you could make an extra bench to go with it that also provides extra seating on the patio when you’re not using the table. 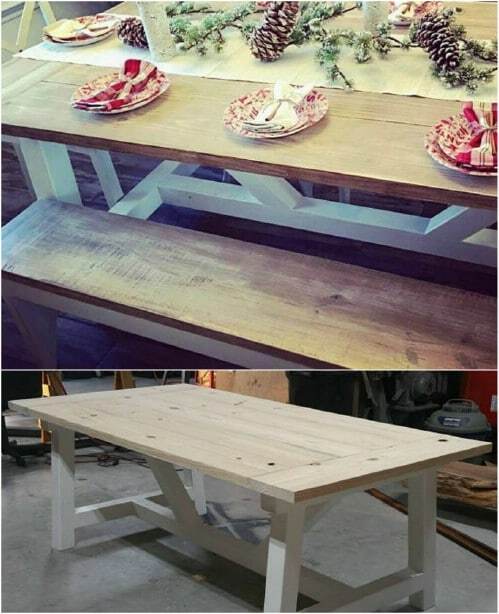 If you really want a rustic look, you just have to check out this DIY farmhouse picnic table. Farmhouse tables have a picnic table quality anyway and if you use pressure treated wood to build this one, it is perfect for your backyard. If you are looking to build some DIY farmhouse furniture for your outdoors, this one is a must. If you prefer to buy as opposed to DIY, I found this gorgeous farmhouse picnic table on Etsy for just over $600. 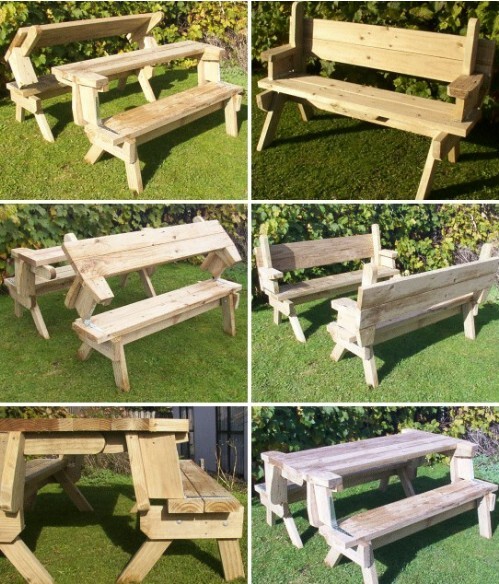 This DIY picnic table has benches that are not actually attached to the table. That means that you can move the table around as needed and even store it when you don’t need it. You can still use the detached benches as extra seating around a firepit or just out in the yard for those warm summer evenings. It’s a pretty easy one to build and you can have it finished in a weekend. 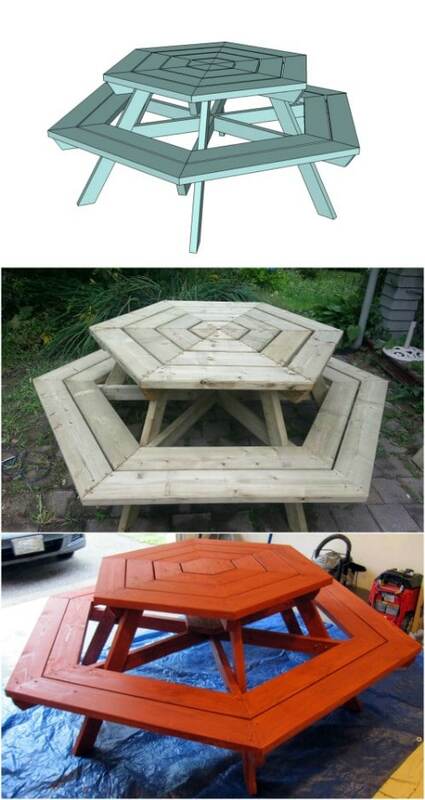 If you don’t like the traditional rectangle shape of a picnic table, try out this hexagon shaped one. It’s just as easy to build as a traditionally shaped DIY picnic table and it has that lovely rounded look that takes up less space and gives it a great decorative appearance. The benches go all of the way around the table so there is plenty of room for everyone to sit. 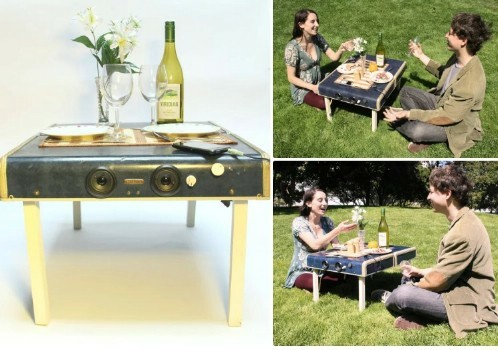 An old suitcase can be turned into an adorable little picnic table for two and this one comes complete with an amazing speaker system so you can blast your music during your romantic picnic. This is a really simple DIY picnic table and it’s a wonderful way to make good use out of an old suitcase. Don’t have an old suitcase to use? Head out to your local thrift store. You can get them at Goodwill for less than $5 each! If you just need a small picnic table for two, this DIY wooden picnic table is perfect. You make this from wood and it’s a really simple DIY project. You can have this finished in just an afternoon or two and it is perfect for those romantic evenings with just the two of you. Just add your DIY benches or a couple of patio chairs and you’re all set. If you love the traditional look of A framed picnic tables, this one is for you. These are super easy to build and you can have this one completely finished in just a weekend or so, depending on how much time you spend on it each day. When it’s done, you can paint or stain it however you want or just leave it plain for a more rustic look in the backyard. 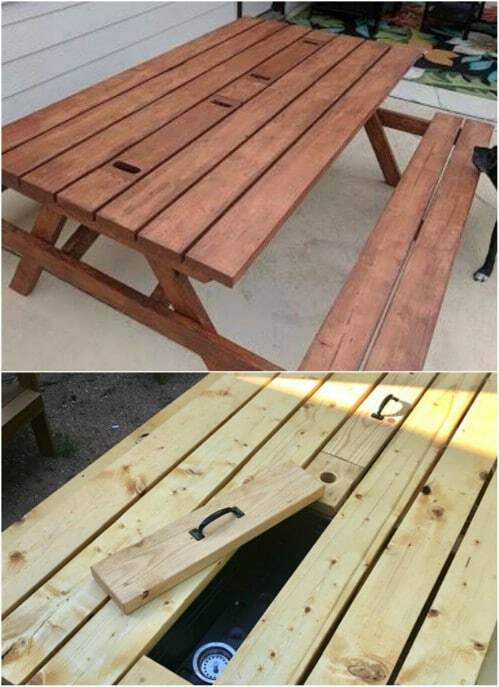 How cool is this DIY picnic table? It has a little cooler build right into the center so you can have your drinks right there on ice where all of your guests can easily reach them. This is a really simple one to build. You just start with a traditional picnic table plan and then adjust it to add the cooler. This one is perfect if you tend to entertain a lot during the summer. You could keep your drinks or even condiments right there in the center of the table. Not only does this DIY picnic table has a section in the center that you can use as a planter, it is a great reclaimed wood project. You could use any number of wood pieces to build this one and if they are all different colors or shades, that just adds to the beauty. 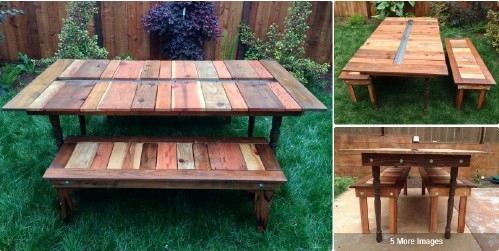 If you have some old pallets, old shelves or even some old cabinets on hand, that would be perfect for building this DIY reclaimed wood picnic table. 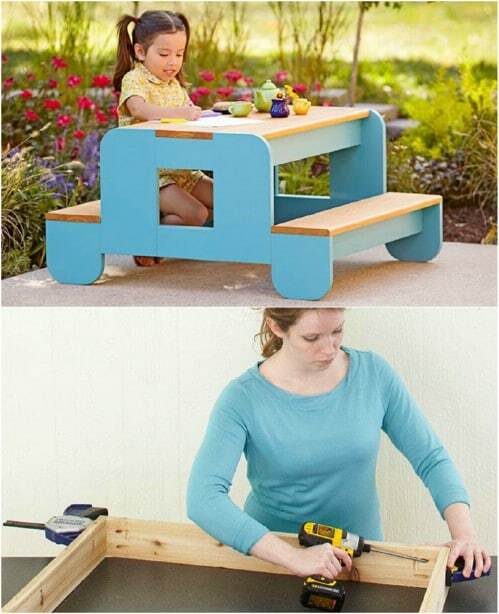 If you want something just for the little ones, this DIY pirate picnic table for kids is perfect. It’s really easy to build and it is so much fun for your kids! They are going to adore the pirate theme and this gives them their own little space for those summer cookouts or for just playing outside. They can use their pirate table for sand or water play or any number of other outdoor activities. 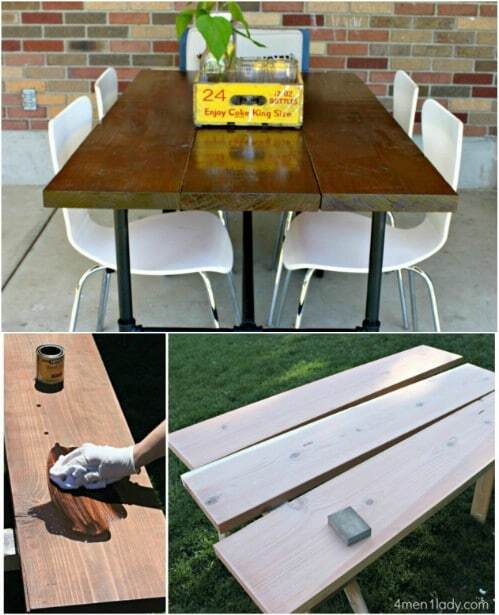 This DIY picnic table is made from an old repurposed door and it is fabulous. It actually hangs! You just attach rope and hang it from a tree and then add your patio chairs or some DIY garden benches for seating. 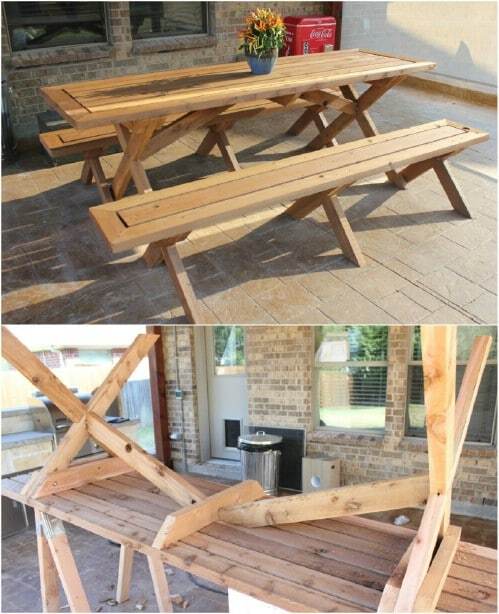 This one is so unique and so perfect if you don’t really have the space for a more traditional picnic table in the backyard. It’s super easy to build, too. 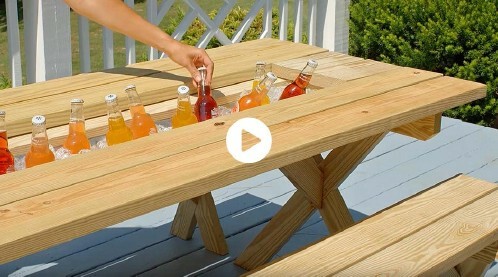 Those old pallets that you have stacked up in the yard just waiting for the perfect DIY project will be perfect for building this colorful DIY picnic table. 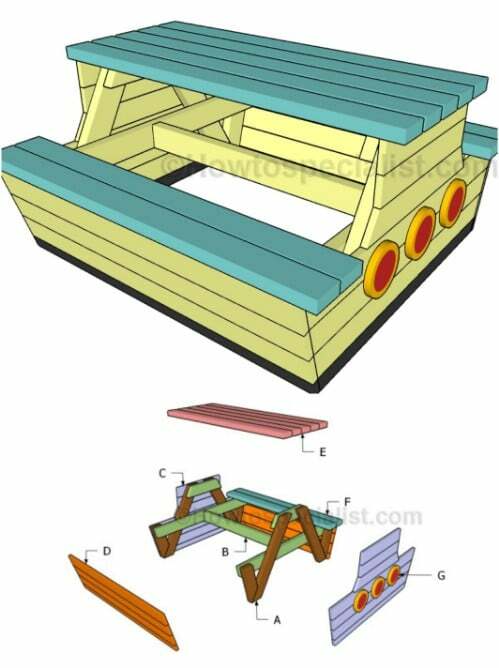 This one is made from all pallets and it is a really easy one to build. It’s also really colorful, which you could skip if you prefer a more traditional look. If you want something fun for the backyard, I highly recommend that you check this one out! Do you need an extra long picnic table? This DIY 12 foot picnic table is perfect for larger gatherings and it even has a roof! You won’t have to worry about too much sun or rain on your party when you build this one and it’s just as easy as any of the others to DIY. It does take a bit more lumber, since it’s so much longer. If you have a large family or tend to host large summer get togethers, this one is a must! There is no rule that says your DIY picnic table has to be made out of all wood. This one uses plumbing pipes for the legs, and it is on wheels so you can move it wherever you need it to go with ease. The top is wood, and you can use pallets or reclaimed wood to build it, and the legs are made from repurposed plumbing pipe – or new plumbing pipe which is really cheap at any hardware store. This picnic table has a trough in the center for use as a cooler but it’s a hidden trough so when you don’t need it, you just cover it up. This is great if you need the extra table space. 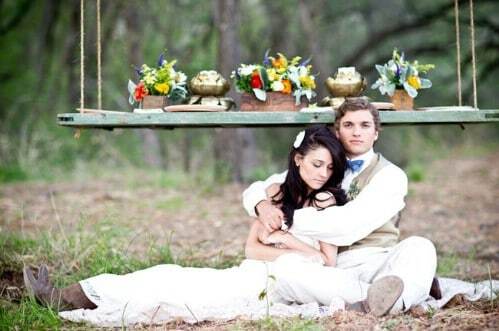 You just put the covers over the trough and it looks like an all wooden picnic table. This would be really easy to build, or you can check out this premade one that I found on Etsy for less than $400. 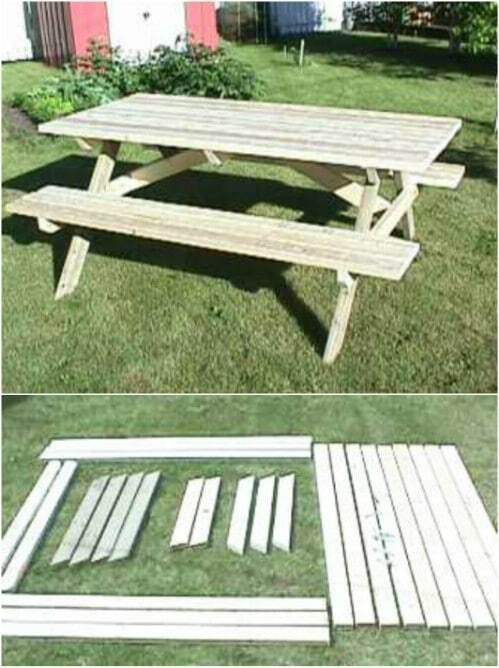 You can easily build this DIY picnic table in just one weekend and the benches are detached so it’s a really easy one to store, too. Also, the plans for this one make it easy for you to hide away the screws so you don’t have to worry about catching clothing or skin on those exposed screws. 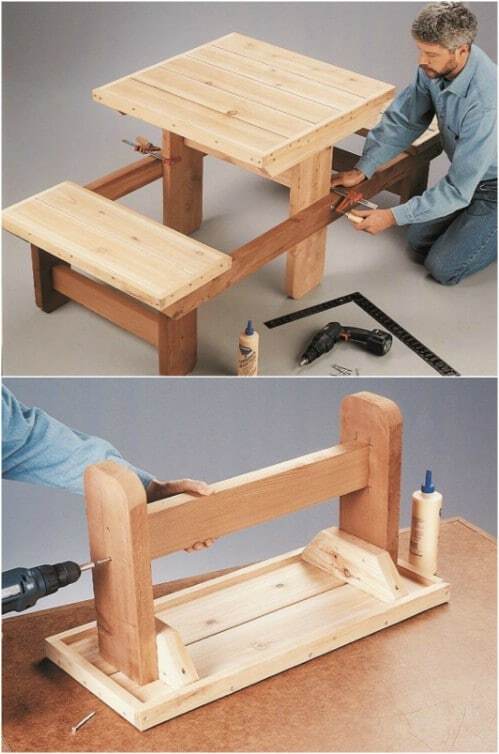 Once you have all of your wood pieces cut, this is a really easy one to put together. Hi! ” I, really think everybody should have some kind of pick-nic -table in their yard! “good idea’s”.